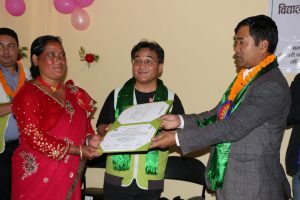 On 2 July 2018, the five-roomed newly constructed building of Saraswati Kunda Agriculture Cooperative and the two roomed- truss building of Saraswati Basic School has been jointly inaugurated by Gajendra Maharjan, Mayor – Godavari Municipality and Country Director of Good Neighbors International Nepal MinHo Choi simultaneously. The program saw a presence of Mohan Nagarkoti of Godavari Municipality Office, Bishnu Man Maharjan, Ward No. 6 Chairperson, Ganesh Bahadur Budathoki, Chairperson of Lele Community Development Centre, representatives from Dhunge Sundarpani Sana Kisan Cooperative of Nallu and Sarange Danda Women Agriculture Cooperative of Devichaur, SMC and PTA members of Saraswati Basic School and over fifty all-women members of the Saraswati Kunda Agriculture Cooperative established in March 2013. The cooperative building has been constructed at an expense of a community support of 2.56 million rupees, 1.53 million rupees contributed by GNI Nepal and seventy three thousand one hundred fifty six worth contribution from Godavari Municipality. The cooperative building is set to benefit the 449 members which constitutes of 396 women and 54 men. The cooperative established in March 2013 has been supporting 138 members with revolving funds for the purpose of cow, buffalo, goat and poultry farming, tomato and mushroom farming, retail and tailoring shops, beauty parlor and pickle and candies enterprise. 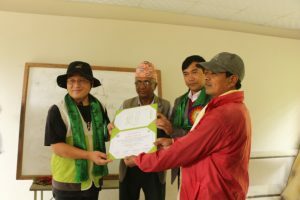 Whilst the school building which was established in 1981 has been constructed at and expense of 2.2 million rupees supported by GNI Nepal and a community contribution of two-hundred fifteen thousand rupees constituting of Land layout and crushed stones. 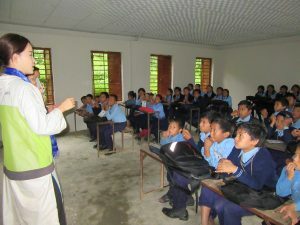 The new building has been constructed in place of a Temporary Learning Centre (TLC) where the children had been studying since the time of the massive earthquake of 2015. The newly constructed school building is set to benefit 121 students and 11 teachers. Handover of the newly constructed Cooperative Building of Saraswoti Kunda Agricultural Cooperative. Handover of the newly constructed building of Saraswati Basic School. Interactive session with the Sponsored Children of Saraswoti Basic School.